Shoveling Laws for DC, Maryland & Virginia: When Is Your Snow Removal Deadline? Storm Team4 is anticipating a major snow event at the end of the week -- which means you'll need to be ready to shovel your sidewalks. Some communities even fine residents over snowy sidewalks. 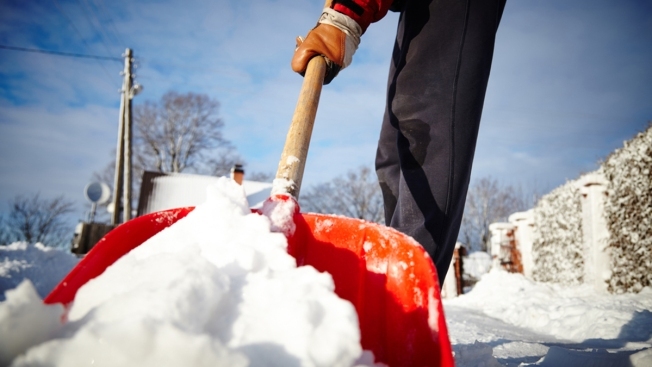 Check your local laws below, and before you head out, read these tips for safe shoveling. Also remember that your neighbors who are senior citizens or who have disabilities may need help before, during and after the storm. D.C. homeowners who don't clear their sidewalks and curb cuts of snow within 24 hours of a snowstorm face $25 fines. The fine is $150 for businesses that don't clear snow within eight daylight hours, according to a new law. D.C. homeowners who don't clear their sidewalks and curb cuts of snow within 24 hours of a snowstorm face $25 fines. The fine is $150 for businesses that don't clear snow within eight daylight hours. News4's Tom Sherwood reports on the rule and how to get a free shovel for helping others. Residential property owners age 65 or older, or those with disabilities, are exempt from the law, GreaterGreaterWashington.com reports. Volunteers will be on call to shovel for these residents; dial 311 or 202-737-4404 to reach them. Montgomery County: Residents and businesses must clear sidewalks around their property within 24 hours after a snowstorm ends. Barnesville, Brookville, Chevy Chase and Poolesville follow these rules, as do unincorporated areas such as Silver Spring. Takoma Park: Residents must clear sidewalks before 7 p.m. on the day of snowfall or four daylight hours after nighttime snow. Rockville: Residents and business owners have between 24 and 72 hours to shovel their sidewalks. The more snow on the ground, the longer you'll have to shovel. (For up to 3 inches of snow, you must shovel within 24 hours; from 3 to 9 inches, you have 48 hours; for 10 inches or more, you have 72 hours). Gaithersburg: Residents and business owners have 12 hours to shovel after snow stops falling. Prince George's County: Residents must have their sidewalks cleared by 48 hours after snowfall. After a warning period, county inspectors can issue a $100 fine for sidewalks that have not been shoveled. Frederick County: Follow the county's suggested shoveling procedures so snow plows do not push snow back in front of driveways. The city of Frederick requires residents to shovel their sidewalks 12 hours after the end of snow. Alexandria: Residents have between 24 and 72 hours to shovel, depending on the storm response level, which you can check at www.alexandriava.gov. At Level 1, you have 24 hours to shovel; at Level 2, you have 48 hours; at Level 3, you have 72 hours. Arlington County: Shovel within 24 hours of snow accumulation of fewer than six inches. Snowfall of more than six inches must be cleared within 36 hours. The shoveling deadline will be posted on the Arlington website, along with tips for residents who are physically unable to shovel. Fairfax County and the city of Fairfax: Residents are encouraged but not legally obligated to shovel their sidewalks. Falls Church: Residents have 12 hours after snow to shovel their sidewalks, or risk a fine. Manassas: Residents have 12 hours after snow to shovel their sidewalks. Manassas Park: Residents must clear their sidewalks during the first eight daylight hours after it snows. Loudoun County: Generally, property owners have six hours, or until noon the day after a nighttime snowfall, to clear sidewalks. The exception is on Sundays, when you have until noon Monday. Prince William County: Residents are encouraged but not legally required to shovel their sidewalks.